After Lung cancer, bowel cancer and prostate cancer, pancreatic cancer is the 4th biggest cancer killer in men, but one that most people haven’t even heard of. 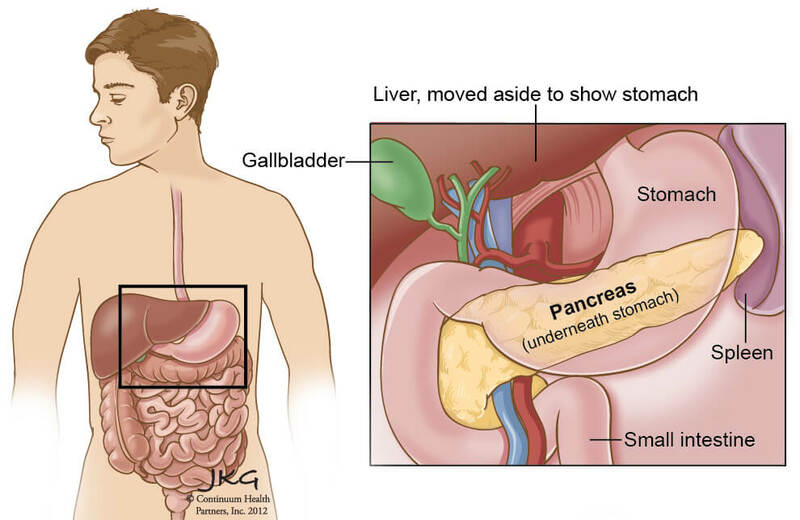 The pancreas is an organ about 15 cm long that sits between your stomach and spine. It makes insulin that regulates our blood sugar and digestive enzymes that breaks down fats in our food. There are two types of pancreatic cancer, named by where in the pancreas they develop. Exocrine pancreatic cancer (95% of cases) is when cancer develops in the part of the pancreas that makes enzymes. Neuroendocrine pancreatic cancer is when the when cancer develops in the part of the pancreas that makes insulin. Pancreatic cancer has a very low recovery rate because it is hard to diagnose in early stages, spreads quickly to other organs, and even once diagnosed, is hard to treat. Because the pancreas is deep in the abdomen, pancreatic cancers can grow for months without being diagnosed. Chances of developing pancreatic cancer increase with age, and it’s more common in men over 60. We don’t know what causes pancreatic cancer but we do know that the following things are connected. Many people who have pancreatic cancer also have diabetes. It can be hereditary. If someone else in your family has it, you’re chances of getting it are higher. If you lead an inactive lifestyle, eat too much fatty food and processed meats your risks are increased. If you smoke, your risks are increased. If you drink a lot of alcohol, or have had gallstones, your risks are increased. Maori men are more at risk of pancreatic cancer than non-Maori. If you are experiencing some of the symptoms, your doctor will do a physical exam and send you to a lab to get a blood test called CA 19-9. This measures your levels of a certain substance that pancreatic cells release. If your levels are high, your doctor will probably send you to have an x-ray or ultrasound of your pancreas. If they find a tumour, you’ll have a biopsy to test for cancer, and potentially a CT scan to see if the cancer has spread. Pancreatic cancer is almost impossible to recover from. An operation to remove the cancer is only possible if the cancer is detected in early stages and hasn’t spread. This only happens in 10-20% of cases. Surgery to remove the cancer is very invasive and dangerous as it involves removing not only the pancreas, but also parts of the small intestine, bile ducts, lymph nodes and gall bladder. Following surgery, you will likely also need chemotherapy. If you‘re unable to have surgery, your doctor or oncologist will discuss chemotherapy, radiation, or recommend you join a clinical trial. These may improve your quality of life but unfortunately pancreatic cancer is almost impossible to recover from. Here are some useful brochures and resources that you can download and view for more information on heart attacks. If you would like to share your story about surviving pancreatic cancer we’d love to hear from you. Fill in the form and we’ll get in touch.